This is one of our classic designs. Here is one of the latest versions. We used etched glass cake stands for the two cakes to make it appear like it's floating. 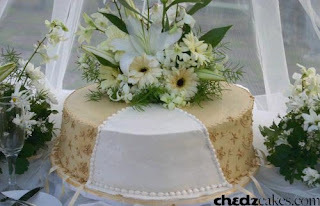 The cake was covered in matte gold and champagne colored icing, with detailed embroidery. We used fresh flowers to decorate the cakes. 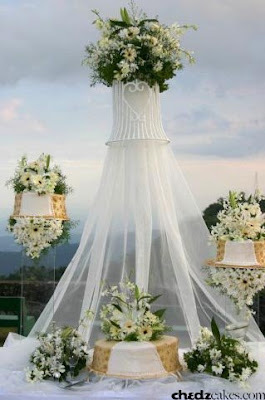 The set-up also included a wedding bell with drapes of tulle hanging. A bouquet of flowers on top completes the look.